Home ⌂→Archives→Trimdon Times Archives 2016→RESTAURANT V’S BAND..WHO WILL WIN? RESTAURANT V’S BAND..WHO WILL WIN? It turns out, they are both winners. Local Indian restaurant Cinnamon Spice Club have agreed to sponsor local band The Voluntears. 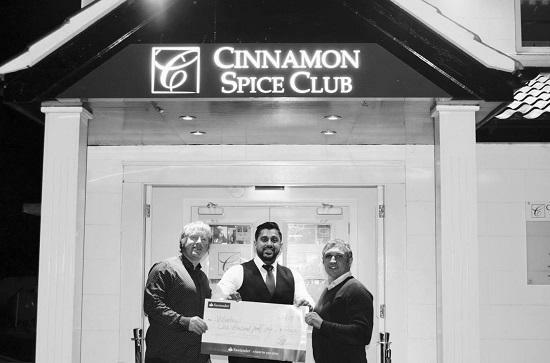 After speaking with Sabir Ahmed owner of Cinnamon Spice Club, it became apparent why he wanted to sponsor The Voluntears. Whilst sitting in the Cinnamon Spice Club bar with Seamus Edge and Mark Dunn, two members of the band, it became clear that The Voluntears felt exactly the same way. Whilst I sit listening to them all talking about the future, it suddenly dawned on me, every thing they talked about all revolved around one important word…”community”. Around Trimdon there is a lot of small villages, and bringing the community together and giving something back to the community is the first thought of both Cinnamon Spice Club and The Voluntears. The Cinnamon Spice Club is an award winning restaurant which is going from strength to strength, with many more awards heading their way and The Voluntears are coming to the end of their 2016 uk tour, with a new single coming soon. In my opinion this partnership is a recipe for success.